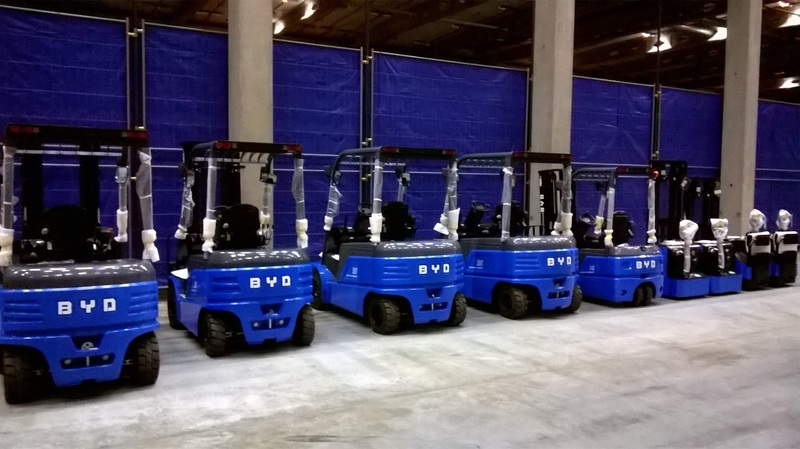 BYD Europe BV (BYD) has chosen Broekman Logistics as its strategic partner for the warehousing and distribution of its range of pure electric forklift trucks. From the start of April, from the Broekman Logistics warehouse at the Maasvlakte - Rotterdam the distribution will be carried out. The collaboration entails moving the logistics process from Maastricht Airport to Rotterdam. “We are immensely proud of our partnership with a major global player like BYD. We are certain that this is the start of a long and successful relationship that will guarantee growth for both companies in the years to come”, says Willem Jan van Amersfoort, Broekman’s Managing Director, Warehousing & Distribution. BYD’s range of products currently includes ebuses and taxis as well as electric forklifts together with the spare parts to support them. Broekman Logistics will perform various value-added activities on the forklift trucks before the products are distributed to end users. “BYD will need to ensure that it always exceeds the expectations of our customers and end users. In Broekman Logistics we have found a good logistics partner to optimise the total supply chain and give us a competitive advantage in Europe,” says Javier Contijoch, Director of BYD Forklift Europe.